Instruction For Use: Ready to drink. Storage: Keep in a cool and dry place. Refrigerate after opening. 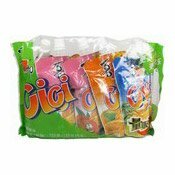 Ingredients: Lychee Flavour: Water, Sugar, Lychee Juice (10%), Coconut Juice (7%), Apple Juice (5%), Fructose Corn Syrup, Taro Powder, Acidity Regulators (E327, E330, E296, E331), Gelling Agent (E508). Apple Flavour: Water, Sugar, Apple Juice (15%), Fruit Syrup, Taro Powder, Food Additives (Calcium Lactate, Citric Acid, Sodium Citrate, Malic Acid, Potassium Chloride, Potassium Sorbate), Edible Essence. Mango Flavour: Water, Sugar, Mango Juice (15%), Fruit Syrup, Taro Powder, Food Additives (Calcium Lactate, Citric Acid, Sodium Citrate, Malic Acid, Potassium Chloride, Potassium Sorbate), Edible Essence. Lemon Flavour: Water, Sugar, Lemon Juice (10%), Coconut Juice (7%), Apple Juice (5%), Fruit Syrup, Taro Powder, Food Additives (Calcium Lactate, Citric Acid, Sodium Citrate, Potassium Chloride, Potassium Sorbate), Edible Essence. Simply enter your details below and we will send you an e-mail when “Strong Jelly Juice (Assorted) (喜之郎綜合果凍爽)” is back in stock!